The game is played with two teams, each consisting of fifteen players. Each team can carry, pass or kick the ball to the end zone to score as many points as possible. The team scoring the greater number of points is the winner of the match. The two teams compete for two forty minute halves with a five minute halftime. One referee controls the match with the assistance of two touch judges. There are no time outs, except at the referee's discretion where he can allow one minute for an injured player to decide whether or not to continue to play. Each team is only allowed seven replacements per game. Six of the replacements are at the teams discretion and a seventh for injury. Once a player is substituted, he can not rejoin the game. The only time a player can rejoin the game is if he was temporarily substituted for a blood injury, but he must return within ten minutes of the substitution or be permanently replaced. The game begins with a kickoff which is taken from the center of the field. The team with the ball makes every effort to score a try once the ball is in play. A try is scored when a player touches the ball to the ground in the opponent's in-goal. The team is then awarded five points. 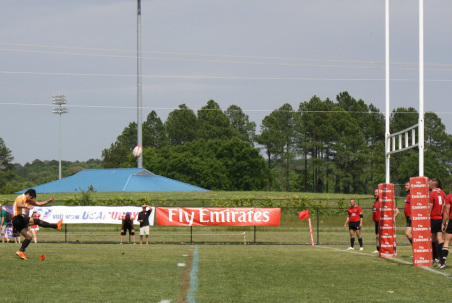 After a try is scored, the team is given the opportunity to score a goal by kicking the ball over the opponents cross-bar and in between the goal posts, scoring an additional two points, also known as conversion points. The ball must be kicked from a line perpendicular to where the ball was touched down. If the opposing team commits a penalty at any time, the offended team can attempt a penalty kick for three points, either at the goal or a drop kick at the goal from anywhere in the field of play. During the game, players move forward towards their goal, however the ball can not be passed forward. The player must pass the ball backwards to his teammates while moving forward. Forward progress of the player carrying the ball may be impeded by tacking that player. Once a player is tackled, he must immediately pass or released the ball and move away from it. Ruck: One or more players from each team, who are on their feet and in contact, close around the ball on the ground. Once a ruck has been formed, players can’t use their hands to get the ball, only their feet. A ruck ends when the ball emerges from the ruck or when a scrum is ordered by the referee. Maul: One or more players from each team on their feet and in physical contact closing around a player who is carrying the ball. A maul ends when the ball is on the ground, a ruck, or the ball or a player carrying it emerges from the maul or when a scrummage is ordered by the referee. Scrum: A set piece formed by the front eight players of each team. The ball is thrown into the middle of the group and each team pushes against the other team's assembled eight men to contest for possession of the ball. 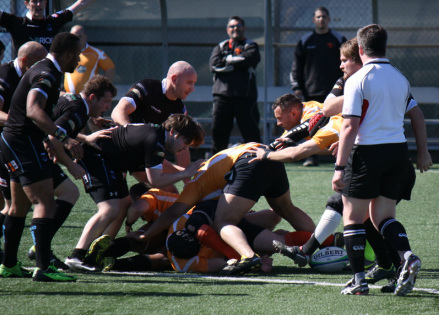 Scrums restart play after certain minor infractions. The scrum ends when one team gains possession of the ball and moves down the field. 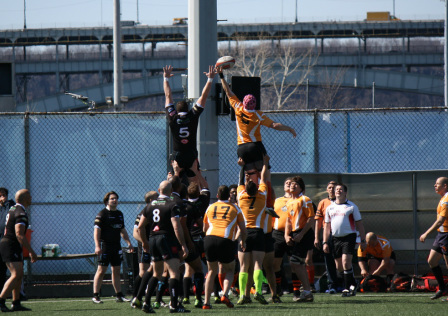 Lineout: Both teams line up opposite each other (similar to a jump ball in basketball), but one team then throws the ball down the middle of the tunnel. Line-outs restart play after the ball, or a player carrying it, has gone out of bounds. A rugby team has 15 positions. Each one wears a specific number and has individual responsibilities. Forwards: These guys tend to be the heavyweights of the team because they do a lot of the pushing, pulling, and scrambling and use their bulk and strength to win possession of the ball. Backs: These are the smaller, faster players that run or kick the ball down the field once possession is gained. Conversion Kick: This kick is worth an additional two points. The conversion kick is taken from a spot in line with where the ball was originally grounded, so scoring as close to the posts as possible is best. Penalty Kick: Penalties for various infractions can be used to take a kick at goal, which is worth three points. Dropped Goal: A dropped goal, which occurs when the player drops the ball on the ground and then kicks it just as it bounces, is worth three points if it goes through the uprights. Rugby is governed by laws, not rules. In a nutshell, when a tackle is made in rugby the requirements are that the tackler releases the tackled player, who then releases the ball so that players who are on their feet can use it. Advantage simply means that when one team makes an error the other team can try to capitalize on it, instead of the referee immediately stopping the action. If the players can’t capitalize on the error, play restarts where the original mistake took place. Specific offsides laws exist for different phases of play, but essentially players can’t be involved if they’re in front of a teammate who last played the ball or are behind the ball when the opposition has it. Offside: A player is offside in general play if he is in front of a teammate who is carrying the ball, or in front of a teammate who last played the ball. It is also illegal to kick the ball to a teammate that is down-field from the kicker. Forward pass: An illegal pass to a player who is ahead of the ball; a player is not allowed to pass the ball forward to a team-mate. Knock on: If a player drops the ball ‘forward’ – that is, towards the opposing team’s tryline – or loses possession of the ball and it goes forward, a scrum is set, with the non-offending team getting the scrum feed. Foul play: Play deemed by the referee as being dangerous, obstructive, unfair play or misconduct. The offending player is penalized, possibly sent to the sin bin or even sent off. Still have questions about the game? Check out the Spectators Guide to Rugby from USA Rugby! 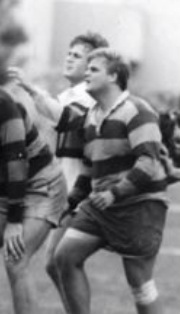 He played in England from 1968-1970 and has been called a "rather lumpy, but excellent" second row forward for the Little Rock Arkansas RFC. He played for Yale during his junior and senior years of college. He lost is front tooth playing rugby when he was 10. He also played for the First XV for Sydney Boys High School, often rated as one of the best schoolboy rugby competitions in the world. He played for the Madrid RFC as a flanker then ended up as a prop. On his love for rugby said, "Being a rugby player in Spain is akin to being a bull fighter in Japan." He experienced his first dose of fame when he appeared on the cover of Sports Illustrated's "Faces in the Crowd" for his achievemetns in collegiate rugby union, football, track and field. 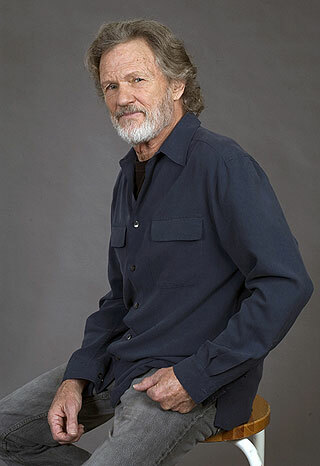 He and fellow classmates revived the Claremont Colleges Rugby Club in 1958. 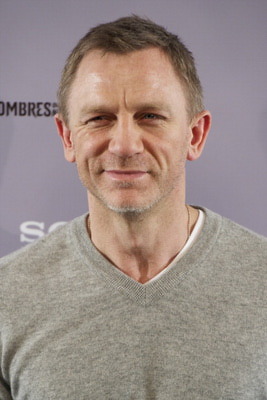 He also played rugby while attending Oxford University on a Rhodes Scholarship. 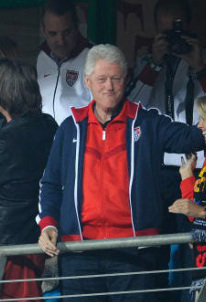 He played rugby at Marquette (he wears the jacket in the movie "Tommy Boy"). He showed up to his first practice wearing baggy shorts and a pink polo shirt. He played for the Hoylake Union RFC in England. He plays for Budowlani Lodz, a rugby club in Poland. They are the current national men's rugby champions of Poland. From the 1400's to the 1800's, many different types of football were played throughout Britain. Years later in 1830, it became common to run with the ball and the sport became popular throughout the UK in the 1850's and 1860's. 1871: The Rugby Football Union was formed and held the first international match between England and Scotland. 1875: Oxford vs. Cambridge, teams were limited to fifteen players per side. 1876: Tries did not have a point value, but were used to determine the winners in the event of a tie. America adopted The Rules of Rugby Football which required players who were tackled to release the ball. 1881: Referees introduced at international matches but they only observed from the sidelines along with two umpires. 1891: The RFU declared that all sides limited to 15 players, 2 points awarded for a try, 3 for a penalty goal and conversions and 4 points for a dropped goal. 1896: Referees were given complete control of the game and the idea of "advantage" was introduced. 1924: America wins the Olympic Gold Medal in Rugby, the last time rugby is considered an Olympic sport until 2016. 1949: Dropped goals were reduced to 3 points. 1958: Penalty kicks were no longer required to travel 5 yards. 1969: The 'Australian dispensation' was adopted, this required that kicks for touch outside the 22-meter line land in the field of play before going into touch, or be returned to the place of kick. 1971: Tries were increased to 4 points, and the Gaelic Athletic Association no longer banned members from playing rugby on the grounds that it was a foreign game. 1992: Tries were increased to 5 points. Thank you to John Ager for his contributions to this page. Information was also taken from "Rugby for Dummies" by Mathew Brown, Patrick Guthrie and Grew Growden, and Wikipedia.